The armor's gone up post-patch. I'm still waiting to see if we still have enough rage to make a DPS role viable. Probably the best DPS warrior helm in game so far. 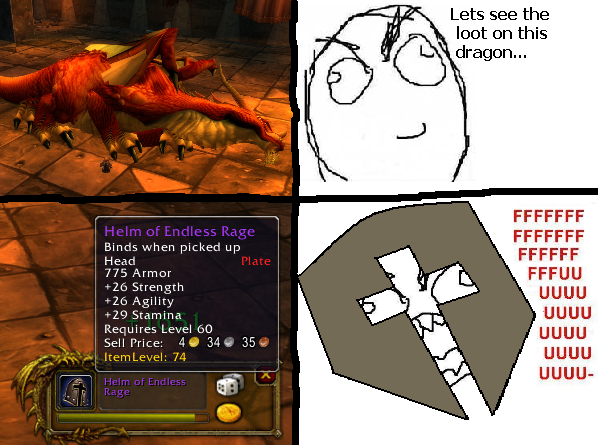 The Lionheart Helm http://www.wowhead.com/?item=12640 is superior for PvE DPS, but the Helm of Endless Rage is superior for PvP. This item demands a comic. Now u can FUS RO DAH! Finally dropped for my DK to complete my Vanilla pre-AQ40 DPS warrior gear.